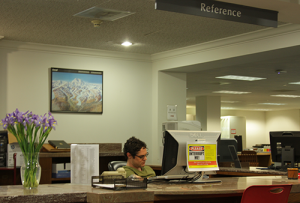 The Research and Instruction Department supports the University Libraries by promoting resources and services that help produce informed researchers. We work with faculty and staff to improve teaching and learning through information literacy instruction designed for students at all levels on the Oxford and regional campuses. We offer research support on all library collections, technology support, STUDIOone guidance, and assistance in searching and evaluating websites. These services are provided both in the library and remotely through telephone, email, or IM chat. Librarians also teach instruction sessions, give tours, and offer a number of workshops. Research & Instruction librarians are subject bibliographers who manage print and digital collections in their subject areas and teach research skills to courses in their subjects. Walk in services available for quick or complex questions. Schedule a one-on-one consultationwith a Subject Librarian. Call us at (662) 915-5855. A member of the FDLP since 1883, UM Libraries provide free public access to U.S. Government information.